I am sitting at a beautiful white desk in my pink home office in our beautiful home in Tzfat, Israel, staring out the window at two soft grey-brown laughing doves. Their name brings a smile to my face. The laughing dove is a slim, long tailed, graceful pigeon. It is pinkish brown on its underbelly with a soft lilac tinged head and neck. The upper parts are brownish with a blue-grey band along the wing. 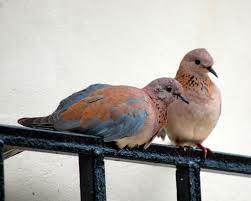 Pigeons belong to the same family as doves as they share many characteristics. Birds have long been viewed as winged, celestial messengers and I can understand why. These lovely sweet faced birds appeared RIGHT AFTER I received the fabulous news that my body scan, in search of cancer, was clean. My body is clear of the dreaded enemy that cuts down many lives. (See my March 5th Blog story about my lung surgery in the essay titled, “Divine Providence at its finest”). I felt the news penetrate to the core of my being and it reverberated through my body producing copious tears of the deepest gratitude. I looked up to the heavens and thanked The King of Kings. Most of you, who have been reading my blog, know that I completely believe and understand on a deep level, that nothing in our lives happens by accident! G-d runs the world! The timing of this occurrence was so extraordinary because it followed so soon after we had completed the reading of Megilat Esther…the scroll of Esther. This scroll tells the Purim story which celebrates the complete turn-around of the nation’s survival in the wake of a plan of complete destruction by Haman. Haman, the arch enemy of the Jews is hung on the very same gallows he planned to use for the Jew Mordechai, who helped save the Jewish people. He and Queen Esther were the loyal Jews who upheld G-ds honor by performing deeds of enormous self sacrifice. The story pulses with evidence of G-ds behind the scenes salvation and clearly reveals His intimate involvement in every moment of our lives and the lives of His nation. What was so extraordinary and full of Divine Providence was that I expected the scan results to arrive in the mail, but they did not. Therefore, I decided to phone and see if I could reach someone as I was, quite naturally, anxious. Normally it is impossible to reach a specialty department of the hospital by telephone. Not only did I get through on the first attempt but I spoke to one of the few people who speaks English and I remembered her name and she remembered mine. She knew the results and told me right away. She was as happy as I and we both kept praising Hashem and thanking Him. IT was so sweet…..so soul nourishing. Wow! Then she was kind enough to fax my results, so that I would have them to take to the upcoming oncologist appointment. And so, here I was once again with concrete proof of G-ds loving kindness and His Divine Providence in my personal life story. The results put me in a reflective mood and I found myself staring at these gentle-faced birds perched on the tree directly in front of my office. Suddenly with a flash of intuition, I decided to look up their metaphysical meaning. I have read that animals can relay messages of healing to anyone astute enough to to understand their teachings. I have come to honor every living creature as a teacher and I have been abundantly rewarded by the inherent, unique wisdom of these precious animal messengers. Once I began to read what the doves represent, I really cried and you will see why. I was in awe of the revelations and messages these lovely, gentle creatures brought to me as a precious gift. They stayed for quite awhile perched on the branch of a beautiful, paulownia tree (one of the fastest growing flowering trees in the world). I heard the sweet cooing of their birdsong and let its melody caress my heart and soul knowing that its message was a gift from G-d. In other words, G-d Himself was comforting me, and reassuring me not only through the good news of the medical report but additionally through the birds and their messages. The Torah teaches that the more you believe in the truth of G-ds Divine Providence, the more He reveals Himself to you. How exquisite! I truly delight in expanding my knowledge in the realm of nature…..it brings me great satisfaction. On another topic, speaking of animals and their hidden messages, I want to share with you an interesting insight. This year was the best Purim for me and my costume played a key role. After recovering from my surgery and going through some emotional ups and downs, I embraced the holiday like a long lost love. I felt an enormous sense of inner joy and awe for my current state of well being and I wanted to manifest my gratitude by creating a day of bountiful good will. I must confess, I still love playing dress up and wearing a costume suits me just fine. This year I decided to be a bumble bee. I chose the costume because I had some of the accessories and I could inexpensively buy a few more items to complete it. But on a deeper level, I have heard it stated that the costumes we choose to wear are an expression of a hidden inner dynamic waiting to be revealed. I have recognized this to be true of my costume choices over the years and this year was no exception. A bee represents love, loyalty and hidden wisdom. The bee reminds us to extract the honey from life and savor it and they instruct us us to make our lives fertile (productive). They are a powerful symbol of accomplishing anything you put your mind to and they represent prosperity. They are organizers and they have tremendous drive. They represent the sweetness of life. I was so touched by the revelation of this powerful teaching that throughout the holiday from start to finish I was buzzing all over the city handing out goodies spontaneously to anyone and everyone we happened upon: a mom and kids walking down the street, a soldier catching the bus, a young man needing a ride, the street sweeper and on and on. 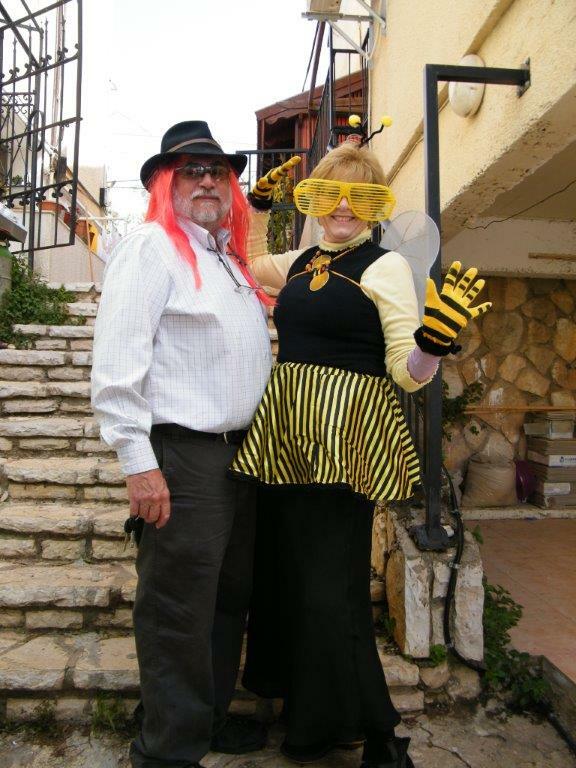 My bee costume brought joy and laughter to the elderly friends we visited and it made me smile from the inside out. BEING JOYFUL CAN DO THAT. I Bless you all, that you should savor life, your health, your precious body, your wondrous Divine soul, your family, your friends, G-ds creatures, and G-d Himself and your connections to HIM. DO NOT TAKE ANYTHING FOR GRANTED AND KEEP YOU EYES ATTUNED TO THE WONDERS OF THE KING OF KINGS. HE LOVES YOU MORE THAN YOU CAN IMAGINE AND HE IS ALWAYS WITH YOU!